MOSCOW, September 28. /TASS/. The Russian Foreign Ministry considers the MH17 probe biased and politically motivated, the ministry's spokeswoman Maria Zakharova said on Wednesday. "Russia is disappointed to see the situation involving the air crash is not changing. The Dutch prosecutors’ conclusions confirm that the investigation is biased and politically motivated," she said. "Appointing those guilty and thinking up desirable results has become normal for our Western counterparts. One cannot but ask: ‘For how much longer will it go on like this?’"
Zakharova recalled that Russia proposed joint work and reliance only on facts from the very outset. "Instead, international investigators have barred Moscow from full-fledged participation in the investigation process, pushing our efforts to the sidelines. It sounds like a cruel joke but Ukraine has been made a full-fledged member of the Joint Investigation Team, which gave it an opportunity to trump up evidence and turn everything to its own advantage." "The investigation continues to ignore irrefutable evidence provided by Russia, although Russia is in fact the sole country that provides authentic information and discloses ever more data," Zakharova said. "We do hope that after the Russian side has shared with the Joint Investigation Team such fundamental pieces of evidence as primary radar data - and it is clear to any specialist that it is reliable evidence all right - the situation will change and the final conclusions, in contrast to the preliminary ones, will turn into objective truth and point to the real culprits of the disaster at last," she said. 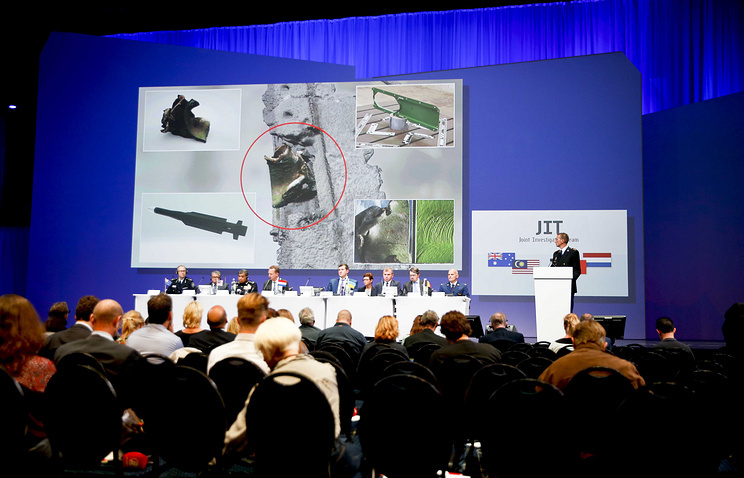 Dutch prosecutor Fred Westerbeke on Wednesday presented the first preliminary report by the Joint Investigation Team on progress in the investigation of the MH17 disaster over Donetsk. The report claims that the Malaysian liner Boeing-777 was downed by an anti-aircraft rocket Buk, launched from an area held by militias opposed to Kiev. A passenger jet Boeing-777 of the Malaysian Airlines (Flight MH17 from Amsterdam to Kuala Lumpur) was lost over the eastern part of the Donetsk Region on July 17, 2014. All 283 passengers and 15 crew - citizens of ten countries died in the disaster.